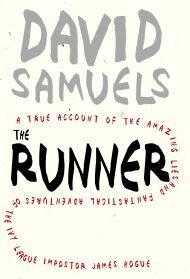 I’m slammed with work (check out the theater’s new website…and please let me know if you find any bugs in it as I’m still tweaking), three magazine assignments due this month, and trying and mostly failing to make time for my fledging novel, but I’m excited to announce that David Samuels’s The Runner is next up on my bedside table and his publicist tells me he’s game for a blog interview. We’re in the midst of figuring out what to do with the child this summer. Any suggestions for east coast camps? I hear good things about Camp Half Moon in GB (camphalfmoon.com), but personally I’d send her to Rock & Roll camp, in Oregon. The BTF website looks FANTASTIC. I don’t understand how you accomplish as much as you do. I am in awe….